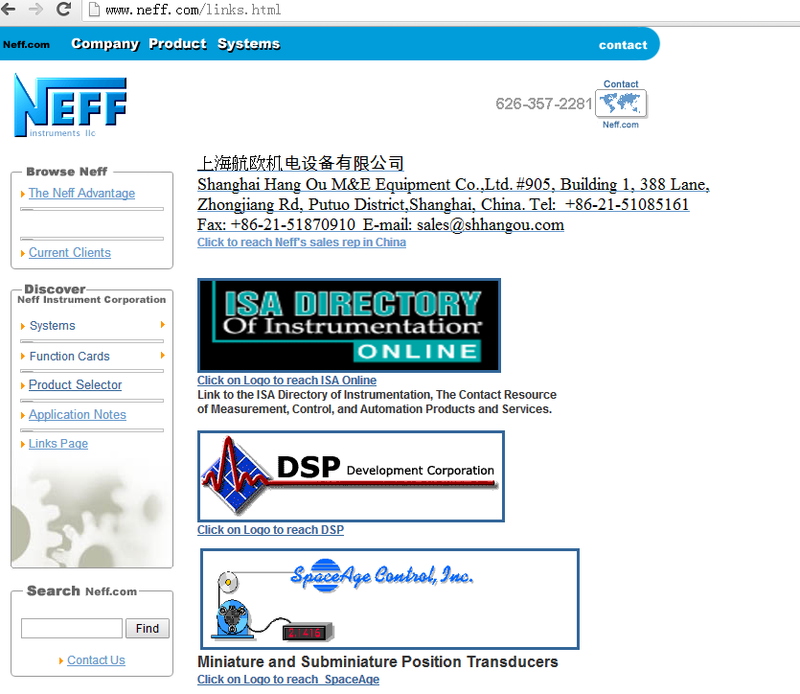 Located in Monrovia, California not far from Pasadena, NEFF Instruments has been a leading manufacturer of high performance data acquisition equipment since its founding in the mid 1950s by Glyn Neff. 470011 16-Bit Isolated Digital Input-AC/DC Signals, 1000V isolation. 470015 2-CH Widerange Freq. or Period Input – programmable modes. 472011 16-Bit Isolated Digital Input-AC/DC Signals, 1000V isolation. The NEFF System 470 (S470) DAS is a complete, low cost moderate-speed DAS for use in computer-based applications. The S470 is designed primarily for computer automated data acquisition in test facilities, laboratories and industrial plants or wherever a moderate-speed DAS is required. The S470 is designed to accept analog inputs ranging from 5mV to 10.24V full scale in 12 programmable steps. Signal conditioning for sensors such as strain gages, RTDs, potentiometers and thermocouples is supplied by standard S470 function cards thus eliminating the need for external sources. Other function cards support digital I/O, frequency measurement and analog output. S470 consists of a 7-inch high, 19-inch wide enclosure with power supply, backplane wiring, I/O Control Logic printed circuit card, Analog Subassembly printed circuit card and 16 I/O card slots that accept any combination of S470 function cards. A Control/Display panel is optional and an expansion assembly is available to extend function card capacity to 32. The maximum number of channels or data points to be serviced depends on the type of function cards used. Thirty-two 16-channel Multiplexer cards, for example, provide 512 channels of analog input while a full complement of 32-bit TTL input cards accommodate 1024 single data points. The Series 600 is NEFF’s top-of-the-line data acquisition system providing the utmost in performance, accuracy and convenience. Featuring leading-edge technology and innovative design, Series 600 brings extensive automation and complete programmability to the testing laboratory. The key to Series 600’s high performance is the effective combination of fully programmable preamp/filters, programmable post amplifier, sophisticated microprocessor-controlled calibration circuits and the amplifier-per-channel data acquisition technique that realizes the lowest noise level and highest common mode rejection obtainable in a data acquisition system. With programmable gain, test setup time is greatly reduced as is the bother and confusion of manual switch settings. In Series 600 the range of each channel is programmable from +/-5mV full scale to +/-10.24V full scale in 12 binary steps. Two types of input preamps are available in Series 600 to allow both static and dynamic measurements. Both have programmable filter cutoff frequencies of 1Hz, 10Hz, 100Hz and 1kHz. Low-level differential preamps (620650 and 620654) have 2-pole and 6-pole Butterworth filters, respectively. The sample and hold preamp (620654) permits simultaneous sampling of multiple low-level input channels and is used where minimum channel-to-channel skew is required. both preamps have fully guarded inputs and operate from grounded or floating signal sources. On command the internal microprocessor takes over control of the Series 600 and begins a sequence of steps to derive and store calibration factors for each channel. The calibration data is stored in on-board memories and during run mode are summed with the post amplifier output voltage to obtain fully calibrated signals for conversion by the ADC.